A hat-tip to NPR. As a public service, NPR has compiled a list of the individuals and corporations who have donated $1 million or more to political campaigns or SuperPACs during this presidential election cycle. Except for a handful of creative people and liberals, it is a conservative landslide. No surprise there. Wealthy people believe that they don’t need government and don’t deserve to be taxed. So, they tend to support the political party that supports their wishes. 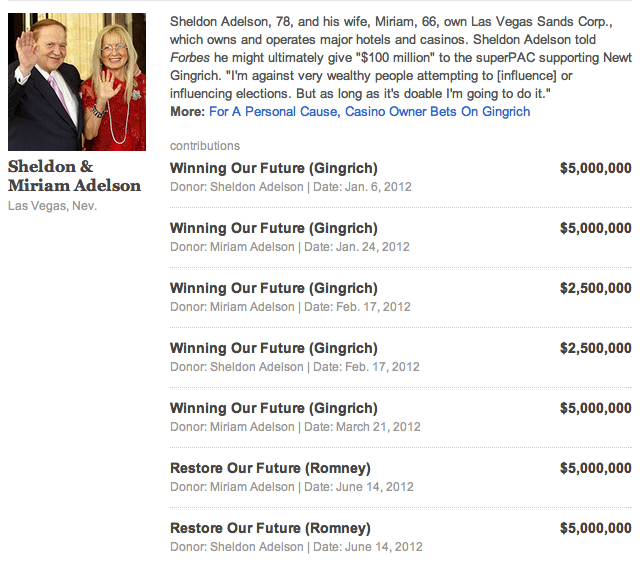 I have not added up all the subtotals, but at a glance, here is a candidate for the biggest donor of them all: Sheldon Adelson. Here’s a guy who made a fortune off casino gambling — literally taking money from people who can almost never afford to lose it. IN what way does all this spending help to strengthen our democracy or improve our society? What on earth gave the Supreme Court the idea that this kind of spending was protected by the Constitution? Do the individuals on the super-donor list love their country more than the rest of us? Do they have better ideas? Do they deserve the kind of giant megaphone that $30 million can buy?